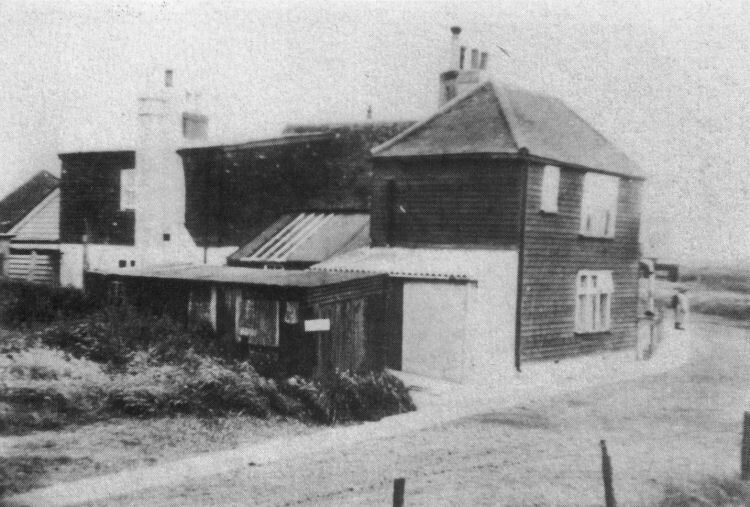 Above photo when Edward Marsh (1861-1934) was landlord of the "Chequers" at Sandhills, Sholden. Above photo circa 1980 after renovations. From the Dover Mercury, Thursday 11 June, 1992. Advertising feature. A stone's throw from the sea set in the middle of of undulating sandhills, the "Chequers Inn" has a position a few pubs could rival. 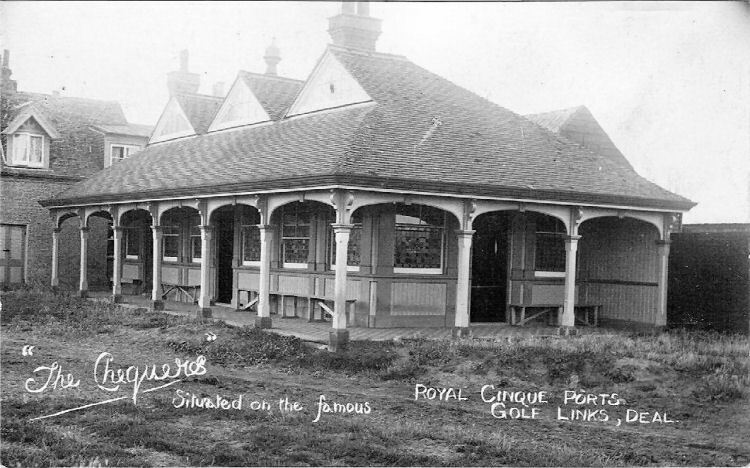 The "Chequers" can be found on the Ancient Highway running from North DeaI to Sandwich Bay just past the Royal Cinque Ports Golf Club. 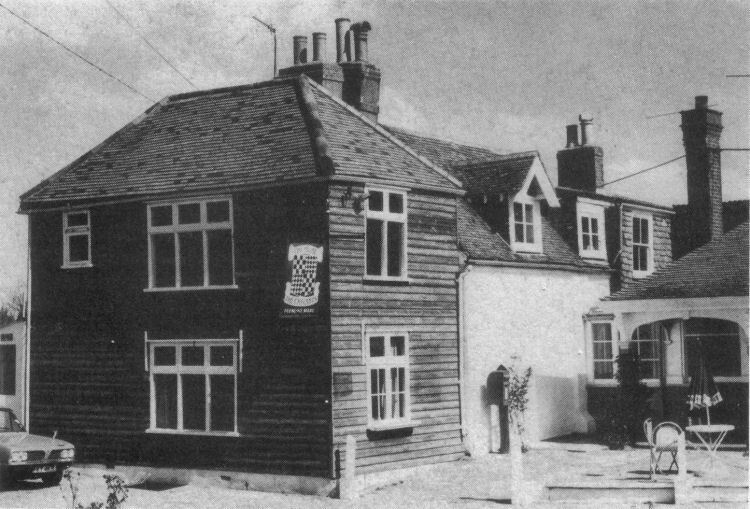 An Inn has stood on the site since the reign of Henry V and the pub has been named the "Chequers" since around 1600. Present owners John and Claire Radford are now in their firth year at the inn and during those years have built up a high reputation for their food. John is an award-winning chef who has worked both in Britain and abroad. he always used fresh food and prepares all the meals himself. As well as a traditional pub food served in the bar - one of the longest bars in East Kent - The "Chequers" offers an a la carte menu in the pub's restaurant. This menu boasts anything from the ratatouille au gratin starters to fillet and sirloin stakes, pork fillets in mushrooms, cream and brandy and beef Stroganoff - strips of fillet cooked with onions, mushrooms, brandy and cream. To compliment the menu a selection of special dishes can be found on the board each day. These vary from fresh bass in ginger and butter to escallops of veal cooked in a lemon, mushroom and cream sauce. The traditional Sunday lunches cooked at the "Chequers" are always popular. For just £6.75 customers can enjoy a three course meal which includes a choice of four roast and a choice of home-made starters and puddings. bar menus include anything from home-made soups, salads and pies to lasagne, moussaka and bouillabaisse, a fish casserole. The "Chequers Inn" has a comprehensive wine list with wines from France, Italy, Spain, Australia, Portugal, and Germany. A bottle of house wine costs just £5.90 but for connoisseurs a bottle of Chateau Lynch Bages will set you back a cool £135. As the "Chequers" is a free house John and Clair can choose all their own beers. 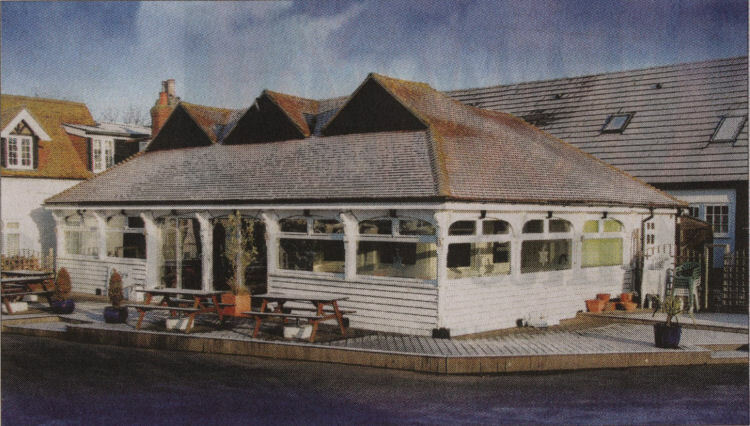 The couple will serve live beers, including Bass, Websters, Ruddle's County and Shepherd Neame Master Brew. The four lagers on offer are Becks, Carlsberg, Holsten and Fosters and three ciders, Dry Blackthorn, Theobalds and Scrumpy Jack, are sold. Fresh flowers arranged by Claire, always adorn the bar and the main entrance has gained a nautical theme - an anchor nearly 200 years old, stands outside. The road the the "Chequers" has just been resurfaced making the trip to the pub a pleasant ride through the Sandhills. But John is quick to point out that the road is an access road to the "Chequers" and is not a through road to Sandwich Bay. In spite of recent rumours John and Claire are still at the "Chequers" and are looking forward to welcoming new customers to their popular inn. Above postcard, date unknown. Kindly sent by Lee Jones. From the Dover Mercury, 27 March 2008. Advertisement feature. A taste of South Africa by the seaside. 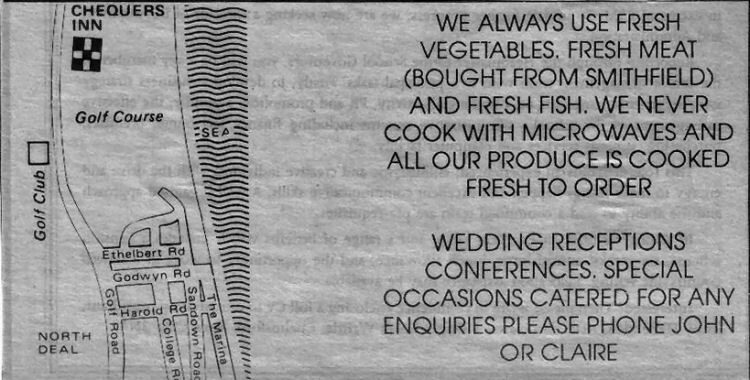 PEOPLE who know it describe the Chequers Restaurant as a seaside gem. Halfway between Deal and Sandwich, on the Ancient Highway, the Chequers is the creation of owners Gary Rose and chef Pieter van Zyl and is that rare blend of high quality professional cuisine and friendly atmosphere. Pieter said: “My style is an eclectic mix of the South African flavours of my homeland with familiar English fare.” Aside from a varied a la carte menu, fresh fish and traditional South African dishes, the Chequers also offers cookery courses and accommodation, with a beautiful self-contained apartment that sleeps five people and which can be rented B&B or half-board. Among the most popular features are the themed evenings, with recent successes including Spanish tapas, a Greek taverna night, and a Taste of Russia. Upcoming are an Argentinean barbecue and a Hawaiian night, both costing £18. On Wednesday and Thursday evenings, the Chequers offers great value with multiple choice menus at £18 a head. Future attractions and all the menus can be previewed on the Chequers website (see below). Book early to avoid disappointment. The restaurant attracts a loyal clientele from across the South East, as well as acting as a rendezvous for travellers from further a field. It is open from Wednesday to Saturday for lunch and dinner, and on Sunday for lunch. For those who make the journey down the Ancient Highway, the reward is a dining experience in a most convivial atmosphere that smacks of summer holidays by the sea. From the Dover Mercury, Thursday 1 July, 2010. Advertising feature. 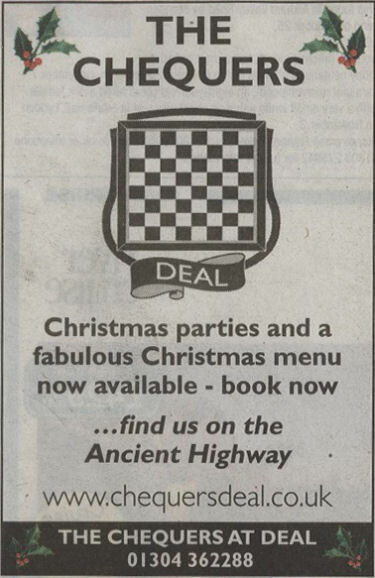 SUMMER is the perfect time to enjoy a visit to The Chequers, located on the Ancient Highway between Deal and Sandwich. This lovely old coaching inn offers a varied menu of tempting dishes that combines the flavours of South African owner Pieter van Zyl's homeland with traditional English fare prepared by his assistant Louise Coombes. Washed down with a glass or two of South Africa's excellent wine, or good English beer on draught, there can be no better reason to enjoy lunch or dinner in one of the areas most peaceful locations. Open from Wednesday through to Sunday lunchtime, The Chequers is an ideal place to end up after a walk, cycle ride or lazy drive, you can even catch the last rays of evening sunshine on the veranda while listening to the skylarks singing high above. Magic - pure magic! Earliest reference found so far is in the Wingham Division Ale Licence list, which shows the "Chequer," (without an "S"), Sholden, to be re-licensed for the sum of 8 shillings in 1740 indicating that the pub was present before 1740. At one time also referred to as the "Halfway House," but I believe this to be a local term and not one an official name. From the Dover Telegraph and Cinque Ports General Advertiser, Saturday, 19 July, 1845. Price 5d. A few days since, a shepherd in the employ of E. Iggulden, Esq., repaired to the "Half-way House" in the Sand-hills; and finding, soon after his arrival, that his stomach was somewhat mutinously disposed, he dispatched a boy to Deal, to purchase by way of “quietus” two penny-worth of rhubarb. The boy not having any precise notion what kind of rhubarb was required, went to a greengrocer's shop, and having provided himself with a couple of excellent bundles, he hastened to the place of destination, (the “Chequers”,) where they were duly delivered, to the infinite astonishment of the impatient shepherd, and to the no small amusement of the assembled guests. From the Whitstable Times and Herne Bay Herald, 24 September, 1887. At the county magistrates Clerks office Deal on Friday, before J Henderson and F Leith, Esqrs, John Beeny, fisherman, and George Goldfinch, painter, were charged with carrying and dealing with 60lbs of cigars, and 90lbs of tobacco, both of foreign manufacturer. Mr Edgar Bruce Payne, of Deal and Ramsgate, appeared for the defendants. James Titterton, Examining officer of HM Customs, London, sworn, said:- From instructions of the Commissioners I, accompanied by three offices, proceeded to the Sandhills about 1 o'clock this morning. Hearing two shots from a revolver firing in the direction of the Sandhills. I fired in reply and ran towards the same. On going a short distance I saw two men, and on going up to then found the two offices, Harris and Hawkins, covering them with their revolvers. I assisted to put the handcuffs on them, they were the two men charged now. I only wish to tender enough evidence for a remand for seven days, in order that the Crown Solicitor may attend to prosecute. I saw two sacks on the ground containing tobacco and cigars they were brought to the Customs House at Deal, and found two white 60lbs of cigars and 90lbs of tobacco, the single value on duty of which is £60 15s. I produce a sample of tobacco and cigars. John Harris, Officer of the Customs, London deposed:- This morning about one o'clock, I was on patrol duty in the Sandhills, between Sandwich and Deal. After remaining in cover some time I saw the two prisoners coming from the direction of the "Chequers" public house on the High Road, each carrying to two sacks with a piece of rope. I was in company with Hawkins, an officer of the Customs. After they passed as we pursue them. They both dropped their sacks and laid in the hedge. Hawkins asked where they were from, the elder prisoner replied "Sandwich;" when asked what they had in the sacks, the elder prison replied "Baggage, and who are you? Are you police officers." The reply was "We are officers of the Crown." The older prisoner then said "I have a few smokes." I discharged a revolver twice, calling for the assistance of my superior officer. The Elder prisoner tried to make his escape, and ran about 500 yards towards the beach. I overtook him and held him at bay till assistance arrived, when he was taken into custody and brought to Deal. By Mr Bruce Payne:- Hawkins ask them what they had, when they said "baggage;" when asked if we were the police, we said we were Officers of the Crown, and then the elder prisoner said they had a few smokes. I fired two reports in the air to call for assistance; did not fire at the men; the cartridges carried ball. The sacks contained tobacco and cigars. Mr Bruce Payne asked for bail if a remand were granted. Prisoners were remanded to Wingham for the Petty Sessions on October 6th, bail being fixed in two amounts of £100 for each prisoner, and himself in £200. Bail was provided. The 1974 Justices On Licences register shows the premises to be owned by Leisurescope Ltd. The pub is Open 2014+ but is now more a restaurant than an actual public house, opening only Thursday to Saturday for lunch and dinner and Sunday for lunch. Also contains two self contained chalets to accommodate two families of two (four berth). This house is situated on the Ancient Highway that runs between Deal and Sandwich, and is now run by Gary Rose and Chef Pieter van Zyl.